On this well-guided private trip we saw all 27 endemics of the Western Ghats of South India and all 33 endemics of Sri Lanka. In South India we were guided by Jijo Mathew of Kalypso (birdskerala.com) with Prasad as driver, and in Sri Lanka we were guided and driven by Sunil de Awis of Baur's (travel.baurs.com; note 2012: at present Sunil is free lance, contact him at sunil.dealwis at hotmail.com or sunil.de152 at gmail.com). Obviously, as we saw all endemcics, I can recommend both guides. Jijo is an energetic and lively man, who not only helped us to find the Western Ghats endemics, but also practically all the semi-endemics shared by South India and Sri Lanka. So in Sri Lanka we could fully concentrate on the endemics of that island, and Sunil is a master in finding them. Gladly, both Prasad in India and Sunil in Sri Lanka were careful drivers. In general, the accommodation was very reasonable and the food very nice. Mostly, beer was available too. We had no health problems, and there were practically no leeches. We had brillliant weather all the time. We flew with Emirates airlines from Düsseldorf (Amsterdam was not yet possible then) to Dubai, where we took a three-day stopover to find some lifers in the desert and on the coast (see report). From Dubai we flew directly to Kochi/Cochin where the Western Ghats endemics tour normally (and ideally) starts. This trip ended near Mysore, and in stead of driving back to Kochi we drove on, along some stunning cultural highlights of India, towards Bangalore. From Bangalore we had a Sri Lankan Airlines flight to Colombo, where the Sri Lanka endemics tour starts and ends. From Colombo we flew back to Düsseldorf via Dubai, with Emirates again. 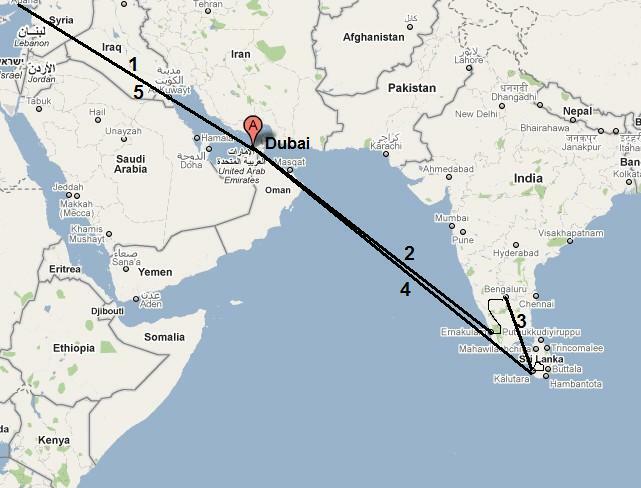 The four-leg Emirates flight was 750 euro pp, and the one-leg Sri Lankan flight 80 euro pp. Both tours had roughly the same structure (see also the regional maps below): first a few days in the moist tropical lowlands (India: Thattekad; Sri Lanka: Kitulgala), then the moist hill region (India: Munnar; Sri Lanka: Sinharadja), then via a drier-climate zone (India: Chinnar reserve; Sri Lanka: Tissa) to the mountains (India: Ooty; Sri Lanka: Nuwara Elyia). The dry zone has only a few endemics (India: 2; Sri Lanka: 1), and in India we stayed there very shortly, but in Sri Lanka we chose to stay there longer in order to see coastal birds and the wildlife of the beautiful Yala national park. For a detailed description of the standard endemics tours, see the websites of Kalypso and Baurs. 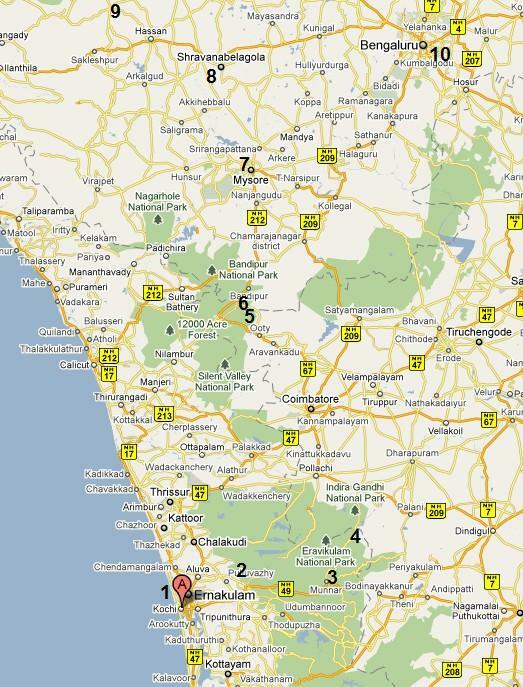 More details of how we fared at the different birding sites are given in the photo sections (South India, Sri Lanka). For the species list, see below. Our flights for this combined trip. 1, 2, 4 and 5 with Emirates, 3 with Sri Lankan Airways. For all lifers also the birding site is given (last column). This is always the first site where we saw it, and for most species also the only site, and for the endemics practically always the classical site to see it.